I have run into some issues with adding support for iOS 11 and iPhone X to Anime Face. I think I have gotten past most of the issues resolved now but I still have one known issue on the iPad which I need to address. Hopefully, I will have the update ready in January. I have started working on an update for Anime Face, but I also started working on a brand new game. Actually the new game is just a new take of a game I previously worked on. I am taking a different approach for working on this game as I am writing it in Java and working with a short sprint/prototype development process. As an example of the shorter process I am currently working on the fourth prototype even though I started the game in the middle of July. My development on G.B.D. has been going really well and I want to continue working on it. I am also excited to get more done on G.K. but I feel like I need to switch over to work on a new Anime Face update soon. I don't really know what to expect from Nintendo's E3 this year, but I do expect there will be some surprises. I expect that Nintendo will release details about the Switch's Virtual Console sometime during the week of E3. I think we could hear about a Pokemon game for Holiday 2017, but if this happens I expect it to be a spin off game where Pokken Tournament on the Switch makes the most sense to me. A big surprise would be the announcement of a Zelda mobile game reveal at WWDC, but this type of reveal is more likely at Apple's September event. I enjoyed my time off at the end of the year even though I was sick for part of it. I didn't end up starting working on a new version of Anime Face since I just wasn't feeling it, but I did make some good progress on the applications I did work on. I am looking forward to the Switch info reveal coming up this week, but I am afraid that I will not be able to buy it on launch day through pre-order or other means. I am just fearful that the demand will out way the quantity which I expect will be lower than it should be. I don't have very much news right now. I have been focusing my development time on G.B.D. which I just finished the current sprint and I will be starting a new sprint today. I am getting ready for taking some time off at the end of the year, and I am considering starting another update for Anime Face during that time. Well I guess I can't predict anything with E3 these days. I was on vacation last week and I was planning to work on my projects some, but I barely got anything done. So I basically lost over week of development time, but I did enjoy my vacation and spending time with family which is good. I normally try to make E3 productions for Nintendo around this time, but it sounds like Nintendo is not showing of NX and only showing off Zelda for Wii U. I expect that they will reveal the name of the game which I expect will have something to do with a book. I do expect we are due for a Nintendo Direct and I expect we will get one in the next two weeks and right now I think June 2nd is the most likely date. After almost nine years, I have finally upgraded my computer. Although I am still going through the migration process I like my new computer and it should really help with my iOS development (especially with time). My old computer took minutes to start the iOS simulator but I think my new one started it in about 10 seconds when I tested it yesterday. I wanted to hold off on working on an update to Anime Face until I got my new computer, so I should be starting working on version 2.4 in the near future. I made some good progress on the update for 1D over my end of year break so a release could be in a month or two assuming I don't run into any other issues. I also got an iOS controller for Christmas, so adding gamepad support has bumped up in my plans. I am getting ready to work on adding gamepad support for my G.B.D. game and then I will be looking at adding it to 1D and Starship: Collector for their next updates. I have finished updates for Starship: Collector and Anime Face so now I am working on an update for 1D. I am still working on some new applications and games, but I don't plan on releasing any of them soon. I am making good progress on the Starship: Collector update but I have an issue to fix in order to finish the iPhone 6 and 6 Plus support. As for one more Nintendo E3 prediction: I expect some new Smash Bros. DLC announcements including the next character. Version 2.2 of Anime Face has been release, although I have noticed a bug which I will need to fix for version 2.3. I have also started working on the new update for Starship: Collector. Although it is still about 3 months off I want to make some Nintendo predictions for E3: First I expect the new Wii U Zelda will be playable and it will either be announced for Holiday 2015 or delayed to 2016. Second I expect there will be an announcement for the "new Nintendo 2DS" which will be released later in the year. I am getting close to finishing the 2.2 update for Anime Face. If all goes well I will be submitting it up to Apple for review sometime this week. So I hope it will be released later this month. On another note I have started the design document of another game idea so now I am debating if I want to start the actual development of it now or not. Right now I am working on four applications at the same time one being the update for Anime Face. I do plan to update Starship: Collector and 1D in the future to support iOS 8 and the new iPhone 6, but that will happen sometime after I finish the Anime Face update. I also picked up a new iOS device recently to help with application development. Because I can't just work on one thing at a time after I finished the Anime Face release I started working on another new application. So I am currently working on three new applications at the same time and I am about to start working on a new update for Anime Face while still working on the development of the other three applications at the same time. E3 is coming this week and I really don't care what Sony or Microsoft plan to show since they haven't impressed my personal taste for the past few years. What I am really waiting for is to hear what Nintendo has up their sleeves. I expect they will narrow down the 3DS Smash Bros. window, but I don't expect a specific date unless it is coming out in June or July (I expect August or September). I also expect they will show off something kind of gameplay trailer for the new Wii U Zelda and announce a new 2014 Mario platforming game. I hope they announce a new 2D Metroid for the Wii U, but it would be more likely for the 3DS. I will not be suppressed if they announce an Animal Crossing game for Wii U and I think a new Mario sports game (I am thinking about Mario Sluggers) also has a slim possibility. Lastly I predict they will have some kind of hardware announcement, but not a new console. I am thinking the hardware would either be a redesign (think 2DS or 3DS XL), a new bundle (Smash Bros), or some kind of controller (Pink Kirby Wiimote?) or other add on. Development has been going slow, but with three applications, work and some other factors it is not surprising. I think I am finally making progress on Anime Face and I have just finished updating the UI for the iPad so it should be down hill from here. Another year has started and I am still working on three Apps at the same time. Working on three Apps at once is really slowing down the development for updates as I expect Anime Face 2.0 is only 25% done at this time. Due to multiple things I am looking at moving all my apps to only support iOS 6+ and maybe only iOS 7+. The Anime Face update is going to support iOS 7's new UI design, which is also slowing down development. All though I don't want to stop development on any of my applications I might put G.B.D. on hold for a little bit when I get to a good stopping point so I can spend more time on Anime Face 2.0 since it has been a while since the last update. I have finished up my work on 1D version 1.5 and I hope to release it on November 1st. If I can't hit that release date I will be waiting a month before I release the update. Now that Starship: Collector has iPad support I am planning to start working on adding iPad support to Anime Face in the very near future. I have recently picked up a Nintendo 3DS and there are a few games that I am currently playing which will take away from some development time. So only time will tell how long it will take to finish the 2.0 update for Anime Face, and hopefully it will be worth the wait. I am still working on the iPad update for Starship: Collector, but I am getting close to finishing it. Progress on the two prototype iterations are going okay as well as I am on the second sprint for both of them. I have put the final touches on my version 1.4 update for Anime Face and I plan to submit it for review some time soon. I have been thinking of another application to work on, and so I am currently thinking of biting off more then I can chew by trying to balance working on three apps at one. My current plan is to update Starship: Collector by adding iPad support, then a small update on 1D followed by adding iPad support to Anime Face. While working on these three updates I hope to complete a prototype iteration for the other applications I am working/planning. I always enjoy the time when E3 is going on, but I just hope that Nintendo doesn't have three bad E3's in a row (based on my opinion, even though in my opinion they have won the past few E3's). I expect to see Smash Bros, Mario Kart, Wind waker and a 3D Mario for Wii U, but I want to see more and know that good games are going to be out this holiday season. At least I have been able to give my Wii U a workout this Spring by playing Lego City: Undercover. I am also hoping to hear about the release of a special edition 3DS XL (like the Luigi one coming to Japan), since I am planning to buy one soon. I have finished my version 1.4 update for 1D which I plan to release on the two year anniversary of the games launch. I am also getting close to finishing the second prototype of G.B.D. which I hope to complete around the start of April. Once I am done with the second prototype I plan on starting on the version 1.4 of Anime Face. Well it is another year, and I might have an update for all of my iOS applications this month. Last year around this time I was planning to have a lot of iPad support for the year, but so far none of my applications currently have iPad support. However, I did do some iPad support for things last year as I started a new game which is only for the iPad as well as adding iPad support for a personal type of project. This year I hope to be able to add iPad support for both Starship: Collector and Anime Face, but that is just what I am planning right now. Over the previous week I put the finishing touches on the first prototype release of the new application I am working on. Now I have started working on the newest version of Anime Face which will include more face parts and support for the larger screen on the iPhone 5. I also just got an iPhone 5 which has already been a big help with some application testing I have done so far. A few weeks ago I installed the latest version of XCode so I could get the upcoming 1D release to support the larger display on the iPhone 5. However, I had no clue what features were removed from the new version of XCode. Since XCode no longer supports my long time development iOS device (iPod Touch 2nd Gen) and the new iOS6 SDK doesn't support any iOS version under 4.3. On the plus side it gave me a good reason to upgrade my iPod Touch to iOS 4.2. Because of the changes made to XCode and the iOS6 I have decided that I will be removing <4.3 iOS support from all my applications with their next update. 1D should be the first application to have the removal of iOS version with the Game Center enabled version I hope to release on November 1st. Yesterday I have released my first major update for Starship: Collector since its launch in January 2011. I am also close to releasing an update to Anime Face. I am planning to watch a good amount of Olympic coverage once they start this week so my app programming time might be limited. That being said I think I could be close to finishing the 1.2 release of Anime Face by the end of the games. After adding the much needed retina display support to Starship: Collector in March I am currently working on adding Game Center support. It is taking a while, but I am getting closest to finishing it. After I have it up for approval I plan to focus on Anime Face to release v1.1.1 and then v1.2. With E3 starting this week I am hoping for an awesome showing from Nintendo (since Microsoft and Sony normally don't show things I care about). I expect there will be a release date and price point for the Wii U (I am guessing $300 for a mid-Novemeber release). I also expect to hear about Super Mario Brothers 4 being a 3D title for the Wii U, Pikmin 3, and a new Kirby and new Metroid game. I hope to hear about new Zelda and Donkey Kong Country games. I really want to hear about a Nintendo SDK for creating games/apps on the Wii U or 3DS for anyone (Like Apple's App Store and the Android Marketplace) and not just for "real" developers. I don't expect to see a screen shot for the new Smash Brothers game. Although I revealed the real name of App3, I didn't call it out from this page yet. So my third App I have been working on is called "Anime Face" and it is scheduled to be released on the first day of Spring (March 20th). I have also finished 1D v1.2 which adds a new game mode, and I am planning to release it on April 1st. I know it has been a long time coming, but I am finally getting around to add retina display support into Starship: Collector and I am about to submit it for review so it should be available in early Spring. Since I started wrapping up the initial release of App3 I have started revisiting my other applications. Starship: Collector got an update on the 20th and 1D will be getting one either March 1st or April 1st. I also have bigger updates (the current updates are very minor) for each of the applications planned as well as my first update for App3. If you haven't noticed yet I have a new page on my website that is dedicated to my iOS applications. Last Monday I beat "The Legend of Zelda: Skyward Sword" so now I have more free time that I can devote to App3. App3 is still on schedule for being released before April because I am getting close to getting the application to Beta. Well I don't make new years resolutions, but I do have some goals for this year with respect to the iOS apps I have been working on. I would like all the apps that I am working on to be playable natively on the iPad by the end of the year. My first goals is to release App3 for iPhone hopefully before April, and then I want to get 1D on iPad and a retina display version of Starship: Collector released. I also hope to start actual coding development on a fourth App this year which I really want to make, but will take a ton of time to make. I was traveling over Thanksgiving so I wasn't able to work on my projects while I was away. So now I need to get back into working on my next App while trying to balance my playing of the new Zelda game. I hope to have my next iOS App ready for release in the first quarter of 2012, but there is too much left to do for me to know if this is a reasonable estimate or not. I am still hard at work on my next iOS App, and I hope to have it getting close to being able to release it by the end of the year. In the mean time I plan to release v1.1.1 of 1D on November 1st. I have been hard at work on my next iOS App. I started continuing my work on T.L. and got it to a playable state, but stopped because I currently haven't decided on what try of graphics I want to use (Normal sprites, CG sprites, or CG models). Recently I have working on an application with the code name App3 since I attend it to be my third application I release and it is not a game this time. I would like to have it done by the end of the year, but there is a lot of unknown still and I really don't know how long development will take. My newest version of 1D is scheduled to be released this Friday so that it will not provide a tutorial so players can figure out how to play the game inside itself. Since the addition of a tutorial adds new content to the game I have increased the version number to 1.1. I have also recently bought an iPad so now I can start working on applications that run on the bigger screen. I am planning to release the tutorial version update (1.0.2) tomorrow for S.C. I am still working on adding a tutorial to 1D, but that is going to take longer to finish. E3 is coming up in a little over a week so I am looking forward to seeing what is going to be announced. I guess my biggest interests is with Nintendo's new console. I am guessing that there are about four ways that they could go with it: 1. Wii HD; 2. A more traditional console like the GameCube/XBox 360; 3. A console that does for online gaming with friends and family which the Wii did for same room multiplayer; And lastly the 4th would be something completely different. I am predicting that Nintendo's main launch title for their new console will be a sequel to New Super Mario Bros. Wii. To honor my donation pledge for the disaster relief efforts in Japan I have made a donation to the Red Cross for $50 which is based on a rounded up value since under 500 units were downloaded. I have updated my SDK and iOS working environment so now I am ready to work with the newer type of features. The first new feature I plan to tackle is updating 1D to support the retina display. On April 1st my unannounced game 1D was released to the iTunes App Store. With 1D I am continuing my donation pledge for the disaster relief efforts in Japan. However, since I don't make any money from 1D since it is free and has no ads I am just donating $0.10 for the first 1000 units downloaded. You can find out more from the 1D homepage. In order to help with the disaster relief efforts in Japan I have decided to donate money to the Red Cross's relief efforts based on the number of new users for my iTunes Apps. So currently that just means Starship: Collector which I will be donating $1 for the first 100 units sold, and then 50 cents for all units sold after that from now until the end of the month. You can find out more from the Starship: Collector homepage. Starship: Collector now has a release date of January 31st! I have thought about working on some enhancements, but that will need to wait to see how the sales goes since that part is new to me. I am also currently spending my "development" time work on a new game (T.L.) which I would like to come out for both the iPhone and iPad, but only time will tell. I hope that I will be able to get my first iOS game (Starship: Collector) in the App Store by the end of the month, but there is a lot of unknown on how the submission process will go. At least the game is at a state now that I could submit it if I wanted to. I also enjoy playing the game which is always a plus when you have been working on the game for a long time. I feel like I am on the final leg of creating my first iOS game. However, when I look closer it is more like I am on the final 6 miles of a marathon instead of the last mile. I have also started thinking about what the next game I am going to work on will be. Right now T.L. seems like the most logical choice, but I also have urges to make anything from a story based RPG game, to a action platformer. Only time will tell what I finally choose. Well it took a little over 80 weeks, but I have finally finished reading the whole Bible (From Genesis all the way through Revelation). I mainly read it just to read it (and to be able to say that I have read it) since I think I have gone to a church service only two times in the past year. After taking this past week off of work I was able to make some good progress on S.C, but I am still a few milestones away from announcing the name. If I am able to put some more good hours into the game I could be announcing the full name in a month or two. I am now one step closer to releasing S.C. but there is still a lot left to do. I hope to have the game done in one year time (I still would like to release it in 2010 if I can), but only time will tell if I will make that date. I haven't been working much on my game projects lately because I have been spending my free time on other things such as reading. I still hope to release S.C. this year, but we will see how things are going at the start of July. After some time having my planned next game project change based on what I am thinking, watching or doing at the time I have made some changes to my site. I have remove release date estimates for all the games I am not currently working on, and I removed the posting of my list of next games to work on. I might list a single next project if I choose to, but it can always change before I start working on it. I have started working on S.C. but since I have just started working on it I am not ready to create a website for it. So any new information I have about it will be on the main page for Puppy Love. The 2.0 version of my Countdown Widget is now on Apple's website and as of a few hours ago it is currently listed as a "Staff Pick". Also SOFTPEDIA has given the widget a 100% clean certification. I have finished and released version 2.0 of my Countdown Widget and I am ready to start my work on my first iPhone/iPod Touch game: S.C. I don't plan to work on my Countdown Widget again for a while since I don't have any ideas on how I want to improve it. I have finished and released version 1.5 of my Countdown Widget and have started working on D.A. but I don't plan to get much done on D.A. before I start work on version 2.0 of my Widget. I have put D.A. on hold again (after finishing my testing of a Java P2P library that didn't work out) and I start to work on version 1.5 of my Countdown Widget. I have made some updates to the Widgets page based on the new work on it along with my normal weekly updates. Also I think I am getting close to releasing my mystery project. I have just released version 1.3 of my Countdown Widget and have started working on D.A. again although I am just testing some peer-two-peer library for the game to use right now. After my testing is complete (pass or fail) I plan to start working on version 1.5 of my Countdown Widget. I have put D.A. on hold again as I start to work on version 1.3 of my Countdown Widget. I have made some updates to the Widgets, Puppy Love, and D.A. pages along with my normal weekly updates. I beat Chrono Trigger with just the first ending, but decided not to replay the game to get more endings since I spent 50+ hours just on that ending. So I have been using the time this freed up working on other things instead. I just have a small update this week making some tweaks to my widget and games pages. I am still busy playing Chrono Trigger and I have run into a problem with the network play for D.A. however, I think I found a solution. Last week I forgot to mention that I have updated my widgets page adding details about my plans to improve my countdown widget. I have done some updates to the D.A webpage, but that has mainly been all I have done. The presentation I was working on for Work took a lot of my time, and then starting on Christmas I had a new game to play (Chrono Trigger for the DS) so these two things are cutting into programming time. However, I have finished the presentation work leaving just the game taking up a good amount of my free time. I just have a small update today besides my normal weekly updates. I have released the tenth comic book for BOP and have added it to the comics page. This will be the last comic that I plan to release for a while. I am planning to make some bigger updates to my webpages early in 2009. Not much to say here except that I have released the ninth comic book for BOP and have added it to the comics page. I have released the eighth comic book for BOP and have added it to the comics page. I also did a small update for the main page for DA. My EBSG Countdown widget is now also available from Apple's website. Well I have finished version 1.0 of my countdown widget and it can be downloaded from my Widget page. Hopefully it will also be available from Apple's website soon as well. I also have made some small web page updates here and there. I am getting ready to start playing Lego Batman, but with my work on my widget I found more time in the day that I was currently not using and I took use of it in working on my widget. So I should be able to put more hours into DA each week then I was putting into BOP, and still spend time playing Lego Batman. For the first time in a while I have updates that do not include a release of the next BOP comic. I have revealed that the widget I am working on is a countdown widget (It is my first widget I have ever made and I wanted to not make something too complex). So to go with this announcement I have added a widgets section to my webpage. I also made a small update to the DA website. I have lots of updates today. In fact I have been in the process of updating basically all of my project pages since about noon today and it is currently after 8:00 pm. I will not go into all my updates that I have done here so you should check out the specific pages/sites for more detailed information on updates and news that I didn't list here. First off I released the seventh comic book for BOP. Second, do to a drop in motivation in the project and an increase of motivation for future projects I have decided to cancel my Flash game Balance of Power: Zenta's Revenge. I also added a new page to the main part of my site called projects. As I have talked about an increase of motivation in future projects there has been a lot of changes on the projects I plan to work in the future, but until I actually get to the point of starting them they are all subject to change. I am planning to start up my work on D.A. again, but if you notice on my projects page I am currently working on a non-game related project, mainly a widget for Mac OS X's Dashboard. Basically I this is because I never made one before and I had the urge to give it a try. Since my last update I have finished playing Super Smash Brothers: Brawl, Mario Kart Wii, and Lego Indiana Jones and I am currently not playing any game. The next game (Lego Batman) I plan to get (Early October) will be the last game I get until Christmas at the earliest, so I will not be playing games much for about three of the next four months giving me more time to work on my projects. I have updated the character data on the BOP page and released the sixth comic book for BOP. I am still playing Super Smash Brothers: Brawl along with Mario Kart Wii, but I am almost done playing both these games. I do have another game I plan to play afterwards, so there will probably not be a period where I am not also playing a game. I have released the fifth comic book for BOP and have added it to the comics page. I am still playing Super Smash Brothers: Brawl, and doing some reading to help with future projects. I have finished the fourth comic book for BOP and have added it to the comics page. I am currently playing Super Smash Brothers: Brawl, reading, and working on Zenta's Revenge so the comic book production will probably be fairly slow for a while. I have been thinking about the game I will be working on after I am done with DA. Now I am thinking of doing the top down 2D game done in 3D instead of the 2D side scroller done in 3D. So I have been working on a Game Design Document (GDD) for the game. Also I have been thinking of using XNA to make it for the XBox 360, but we will see what consoles are out when I finish DA. I have finished the third comic book for BOP and have added it to the comics page. I am currently playing Phantom Hourglass but I almost have that beat so the comic book production could pick up after I beat the game and before Super Smash Brothers: Brawl comes out in March. I have added a prototype for Balance of Power: Zenta's Revenge to the BOP game section. I have finished playing Super Mario Galaxy so the work on the next comic will increase until the start of the holidays. I have added the Balance of Power Tale Two comic to the comics section. I am now just starting to play Super Mario Galaxy so the work on the next comic will not be as fast as tale two was. I fixed the comic viewer so it now works. That means you do not have to download and unzip the comic to read it. I have finally released the meaning of B.O.P. It stands for Balance Of Power. I also added a comics section with the first Balance of Power comic released. However only the download works right now I will need some more time to get the viewer working so you can view the comic right off the webpage and not worry about downloading and unzipping the file. I updated the B.O.P. website a tiny bit. Also I plan to reveal one of my new projects late September. I will have to work hard to get it done in time since I am only about 1/4 done right now. So check back in late September early October for my new project. I have gotten rid of the sign guess book links because all I have been getting is a lot of spam. I have some non-game items in the pipe line but it will probably be a while before you see any of them. I have to buy some software and equipment before I can start production of them. Also I have my game schedule all setup for my next three games. After BOP I will go back and finish DA. Then I will make a 2D platformer done in 3D followed by a top down game 2D game done in 3D also. With all this stuff I will be busy for a long time. Since I am only one person don't expect things to come out quickly. It will take a lot of man-hours for me to just finish one of my projects. I made a few small updates to the BOP website. I have released the BOP website which can be accessed from the games page. 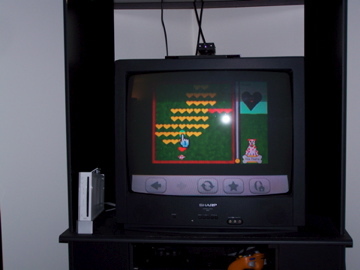 First Puppy Love came out of the PC and now you can play it on the Nintendo Wii, as seen in this picture. Wow it has been a while since I last updated. I am still working on BOP but it is coming along slowly. I still have some foundation classes to make before I can start working on the fighting engine. In news Puppy Love has been published and a link to buy it can be found on Puppy Love�s website. It has been a while since I last updated. I have put DA on hold and have started work on a new game for IGF 2008. The game was originally called Ball, but now I am giving it the name BOP. However, this game has nothing to do with Pong or a Pong clone as the names make it sound. Instead the game is an RPG with a unique fighting system. I am currently working on trying to get Puppy Love published. I am also considering putting D.A. on hold again to make a new Flash game to enter in IGF 2007 or 2008. I finished off Dragon Quest 8 so I have started ramping up the production of DA again. I also added a little trick to try to decrease the spam I have been receiving with my guest book. So to sign the book make sure you have Java Script turned on. I am still working on DA, but my work has slowed down because I have been busy playing Dragon Quest 8 which is taking most of my evenings. Well Puppy Love did not make it into the finals so I will be focusing my coding effort on DA. I have started a simple website for DA, but it will be pretty bare bones until I make much more progress on the game. It has been a while since I last updated so I will tell you what I am working on. I am currently working on a Java game, which is like a card-battle RPG with the code name of DA. That is all that I am going to say about it except for the fact that I don�t plan to enter it in IGF. However, if Puppy Love makes it into the finals of IGF I will put DA on hold to make a new Flash game for IGF 2007. I entered Puppy Love into the IGF for 2006. I have just released the game I have been working on. For more information see the games page.